Twelve months of amazing rehabilitation resources—more than 600 pages of rehabilitation lesson plans—what a year it’s been! 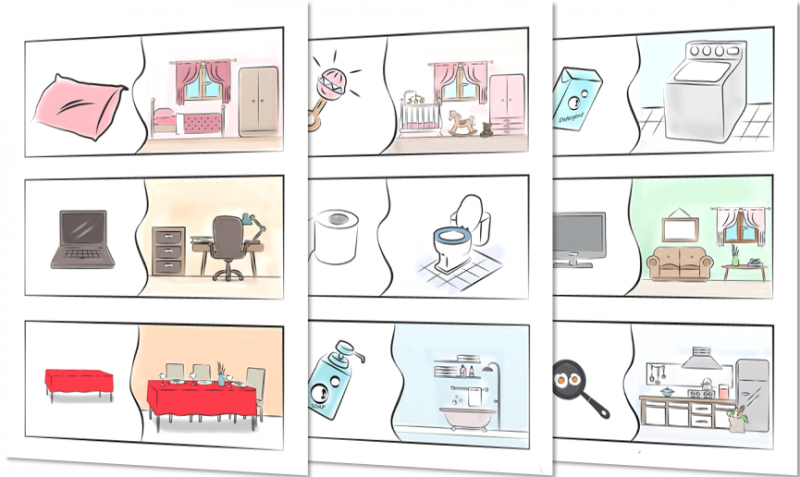 Every month for the past year, we’ve shared a brand new Themed Lesson Kit for free download. All of the comprehensive lesson kits are always free to download—you’ll find links to all the kits at the end of the article. Today, we’re excited to be sharing an interview with Rebecca Claridge, the dedicated rehabilitation therapist behind our Themed Lesson Kits. 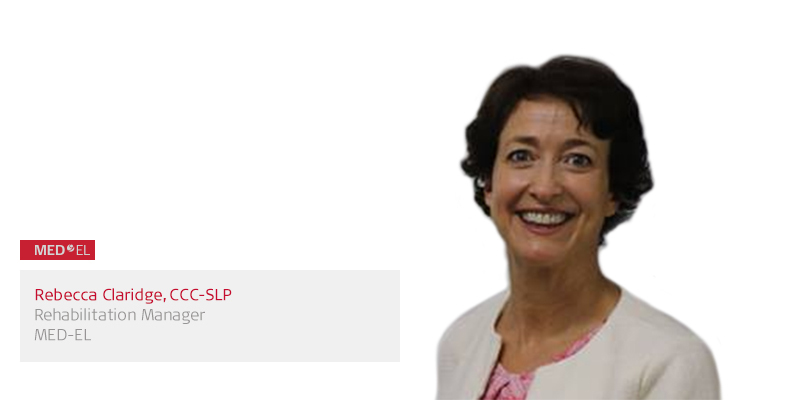 Rebecca is a speech language pathologist and an AG Bell certified listening and spoken language specialist. Let’s go to Rebecca to find out why we created these lesson kits, how to use them for aural rehabilitation, and how you can make sure you always know when the latest kit is ready for download. My pet project over the past couple of years has been working with the MED-EL rehabilitation team in the development of the Themed Lesson Kits for aural rehabilitation. The idea for the lesson kits stemmed from a conversation I was having with fellow auditory verbal therapists. We were discussing how we can manage our caseloads and still provide the desirable detailed lesson plans, goal focused activities, and accompanying resources—when the expectation was that we needed to see more and more clients every day. Some clinicians were reporting that they were expected to see eight clients for one hour appointments per day. Realistically, this means no time can be allocated for lesson preparation. 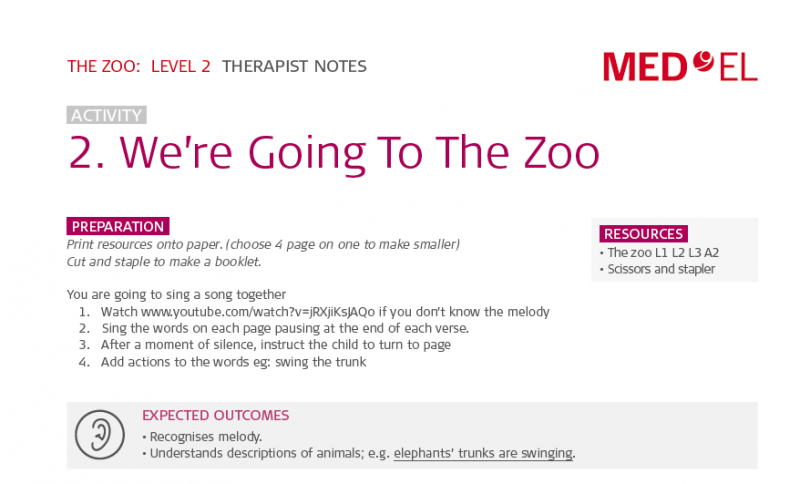 So, the original goal of these lesson kits was to provide ready-made resources that therapists could use to target specific listening, language and cognitive goals. Then, along the path of development, this was extended to include some therapists’ notes that therapists new to the field of working children with hearing impairment could use to develop their skills. Our expectation was that these therapist notes would lead to improved outcomes for children across the globe. The first rehabilitation lesson kit was published here on the MED-EL Professionals Blog in March 2017. There’s been a new lesson kit available for download every month. And they have proven to be really popular with speech-language pathologists and rehabilitation therapists. In addition, parents of children using hearing technology can use these resources, too, and why not? Who wouldn’t love getting access to free stuff that you can download and print and use in meaningful interactions with your children? So, let’s take a look at the details of these aural rehabilitation lesson kits. Each lesson kit is 40–80 pages, and includes instructions, therapy goals, lesson plans, and printable illustrations. 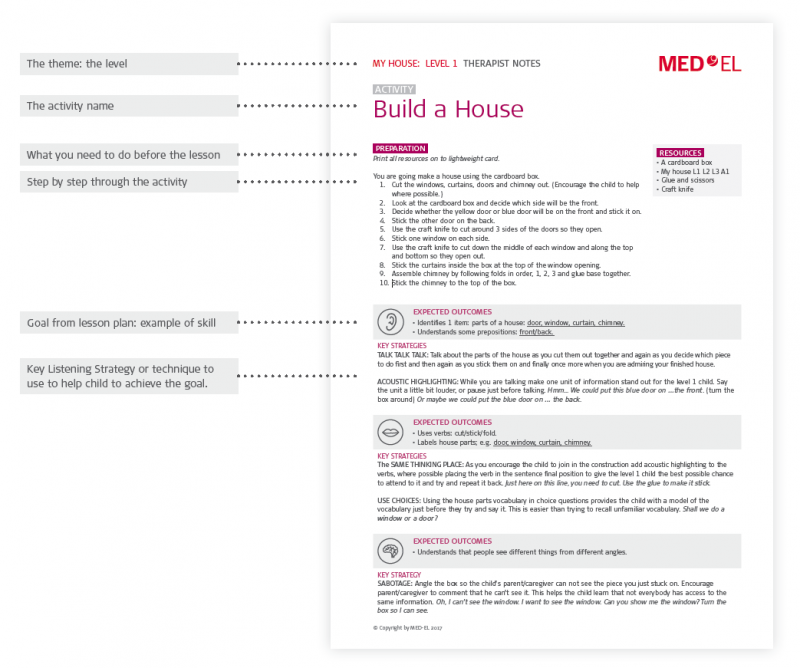 Each lesson kit begins with a step-by-step explanation of how to use the lesson kit. This includes an explanation of the key that is used on each lesson plan. There are listening goals, speaking goals, and cognitive or theory of mind goals. The kits include a guide on how to choose the level to start the child off on. Every kit contains three complete lesson plans; one for each level. Each lesson plan includes a table for recording the child’s responses to the Ling Six sound test. This is a simple test we use in every lesson to confirm the child’s audio processors are functioning optimally and they can hear all the sounds they need to develop spoken language. Each lesson contains four activities. And each activity has specific resources to be printed off. For each activity at each level you have a page of therapists’ notes to help the user get the best out of the resources. The therapist notes identify the activity and level on the top left, followed by the activity name. You will read about any necessary pre-lesson preparation and this is kept to a minimum, acknowledging the pressure on therapist’s time. Then you will be guided step-by-step through how to do the activity. The goals are listed on the therapists’ notes and these are the same as on the lesson plan. And lastly, the introduction highlights and explains essential strategies to use and to coach parents to use to help their child achieve their goals. Generally, the lesson kits are published in a macro theme one month, followed by a related micro theme the next month. This macro/micro structure is to assist with the consolidation of vocabulary through the expected repetition. It also acknowledges the research into the positive effect on vocabulary recall of calling attention to relationships between words. Each kit includes a story or a song book. The stories are original books written specifically to target the needs of children with hearing impairment. The songs are mostly well-known songs that can be searched online for the melody, or they are modifications of songs to suit the needs of children with hearing impairment. 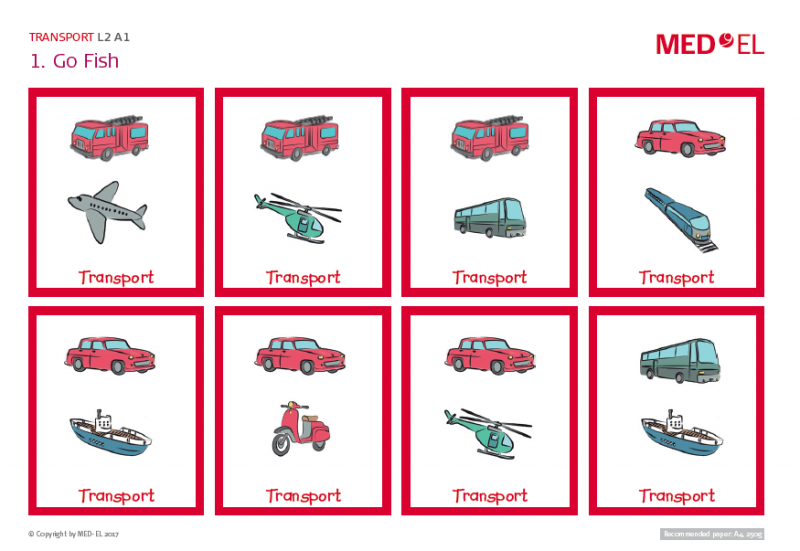 The illustrations have all been specifically drawn for us to facilitate vocabulary development. The pictures are cute, but not too abstract. 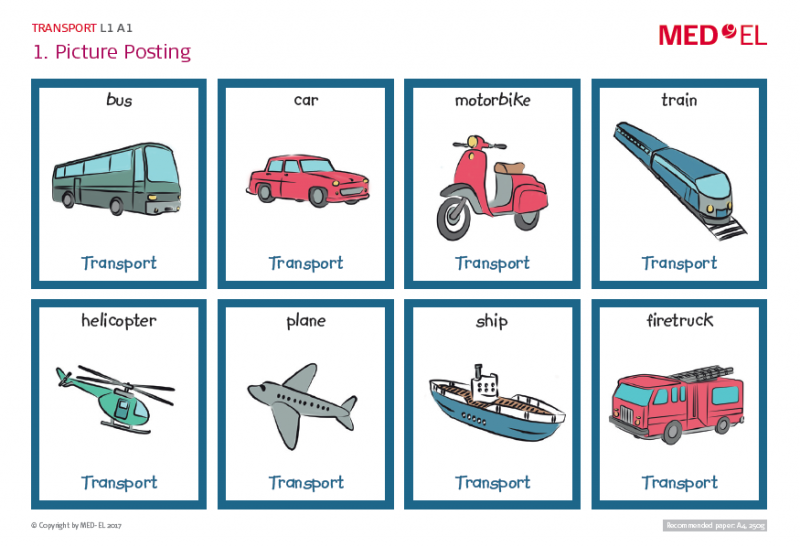 Which means children can recognize and consolidate what they know, and can generalize new knowledge learned from the pictures onto other examples. What else will you find in the lesson kits? Each kit has a range of activity types that can be printed and used in a number of ways. For example, these self-correcting puzzle cards can be used like a match-up game, a memory game, or a go-fish game. You can prepare the printouts with the child. Maybe young children won’t have the skills to cut and paste or some of the skills may be beyond the child’s ability. But even doing these activities together with the child provides opportunities for listening and spoken language development. Some activities have different resources for each level. Here is an example of a card game for a child learning to listen to and remember one piece of information. And here you have level 2. For two-item listening and instructions to play a game of go-fish. And here you have level 3, for a more advanced listener who is able or learning to attend to three pieces of information. We call this a three-item auditory memory task. In this kit, you’ll find instructions to play an original game called “fast hands”. There are activities that are done away from the table that help develop gross motor skills and the opportunity to focus on word types that are not nouns. 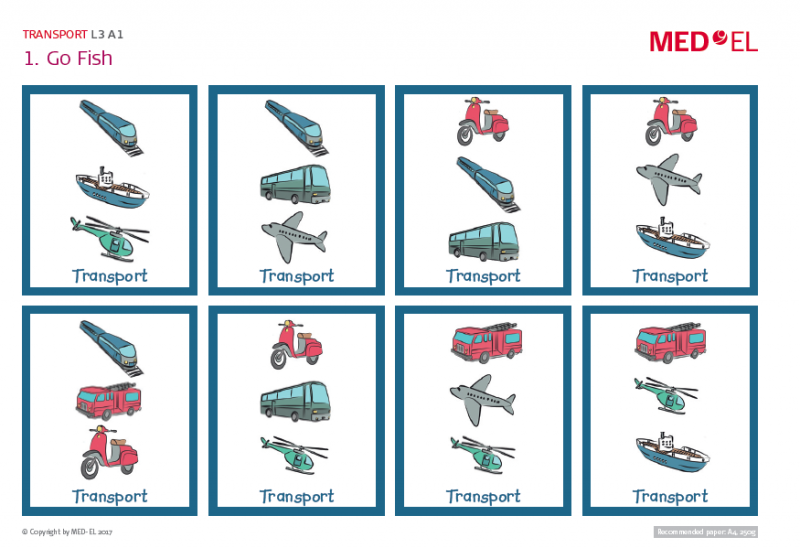 And the vocabulary becomes more sophisticated in level 2, and vocabulary development continues through level 3. There are activities to encourage fine motor development along with listening and spoken language skills. And there are craft activities to engage all. There are game boards to teach the language required for organized games. And these games help children practice the social skills required, say, if you don’t win—or even if you do win. There are simple games for young children and beginning listeners. And there are more advanced activities that encourage literacy skill development. To facilitate literacy skill development, English text is included. And to allow non-English speakers access to the resources, where possible, a copy of the resource is provided without the text. These language-neutral illustrations allow the user to choose to write in their own language if desired. The resources are designed with specific emphasis on theory of mind skill development. Theory of mind is our ability to think about our own thoughts, feelings, and desires. And also, to think about, understand, and make predictions about the thoughts and feelings and desires of others. So, for example, we explore identifying and labeling emotions in others. Research has identified that children with hearing impairment continue to have delays in theory of mind development even if they have age appropriate language skills. So, in each kit there are specific activities that target theory of mind development. Of course, there’s loads more therapy techniques inside the kits—you’ll have to check them out to discover all the useful resources! Thank you for guiding us through the Themed Lesson Kits Rebecca! Ready to get started with the themed lesson kits? You can download all of the lesson kits for completely free here on the MED-EL Professionals Blog. Get all the kits below! Don’t forget to subscribe to the MED-EL Professionals Blog to get the latest articles sent directly to your inbox! We’d love to hear your feedback on the lesson kits—leave a comment below or send us a note with our simple contact form!